Iceberg calving events are among the more epic spectacles on the planet. But rarely have humans been lucky enough to see them happen in real time, much less capture one on camera. A team of New York University (NYU) researchers has now done just that, capturing video footage of a four-mile long iceberg snapping off east Greenland’s Helheim Glacier. The footage is a stark illustration of one of the most important processes reshaping Earth’s coastlines today and in the future. 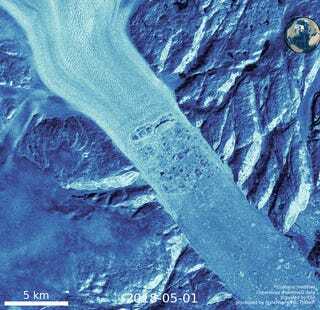 Greenland’s outlet glaciers are like frozen rivers, flowing to sea from the island’s interior. As ice enters the ocean, it raises sea levels, a process that is expected to quicken as Greenland warms. In recent decades, the ice island’s “big three” outlet glaciers—Helheim, Jakobshavn, and Kangerdlussuaq—have sped up substantially, a phenomenon scientists believe is linked to climate change. 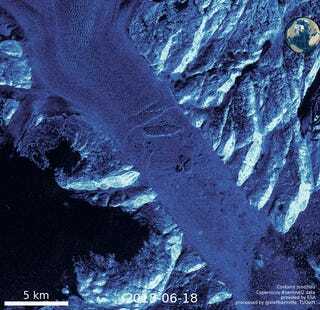 The new iceberg broke off Helheim over the course of 90 minutes near midnight on June 22. The research team was lucky to bear witness to it while they were out in the field doing routine equipment maintenance. Denise Holland the logistics coordinator for NYU’s Environmental Fluid Dynamics Laboratory, told Earther the scientists were just getting ready to go to sleep when the glacier started making a loud, sustained rumbling noise. She immediately got up and set up her video camera. Animation showing the evolution of Helheim glacier from May to early July, with a large glacier breaking away from the calving front on June 22. While its exact size is not certain, the NYU researchers estimate the ‘berg spans an area roughly the size of lower Manhattan. Tad Pfeffer, a glaciologist at the University of Colorado, Boulder told Earther via email that a calving event of this scale is large “but by no means unprecedented” for Greenland. A nearly 100 square-mile iceberg—roughly equivalent to four Manhattans—broke away from Petermen Glacier in northwest Greenland in 2010, followed by another ‘berg about half that size in 2012. Then there was the iceberg that broke away from western Greenland’s Jakobshavn Glacier in 2008 captured in the film Chasing Ice, which Pfeffer said was also somewhat larger than Helheim’s new ice baby. “The real message here to me is not that this particular event is unprecedented, but that it’s not unprecedented: that these monster calving events are becoming more and more common as time goes on,” Pfeffer continued. Before and after of the June 22 calving event. Mike MacFerrin, another glaciologist at University of Colorado Boulder, noted that Greenland icebergs “pale in comparison” to the enormous hunks of ice breaking off Antarctic ice shelves from time to time. However, that doesn’t mean they’re insignificant or unrelated. In fact, a goal of the NYU research team is to better understand how glacier calving works in general in Greenland, and apply that knowledge to relatively hard-to-access ice titans down in West Antarctica (which is also home to some of the sickest ice on the planet).